The battle over the Santa Blanca Cartel may be won, but the war is far from over. In Tom Clancy’s Ghost Recon® Wildlands: Ghost War, Special special Ops ops units are moving in and it is your job to fight them off. The battle will not be easy, but by utilizing teamwork and strategy, you will come out the victor. We have already shown you the Sniper, Pointman, and Scout, but they will not be enough. Today we are thrilled to show you three heavy hitters you will have at your disposal to further balance out your team. 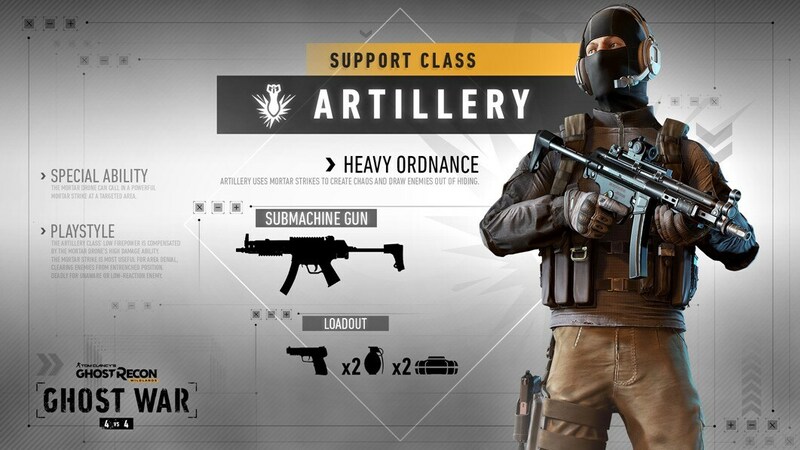 At launch, Ghost War will have twelve classes separated into three categories: Assault, Marksman, and Support. Creating a balanced team will be an important part of your tactical approach to every battle. Choose from a variety of available classes, from those that rely more on stealth to heavy-hitting front-runners, to take down your enemies. We will continue to add classes after the launch as well. Tanks fall under the Assault class and, as you can guess from their class name, their protection is much higher than usual and they have increased endurance. They also wield powerful weapons, making them deadly foes in close- and medium-range combat. Finally, Tanks have the unique ability to remove all active marks on teammates, while marking themselves. This ability lasts a set amount of time, so it should be used wisely. Tanks really shine when their allies are in trouble or trying to flank the enemy. Tanks are perfect for players who love to be in the middle of the action. 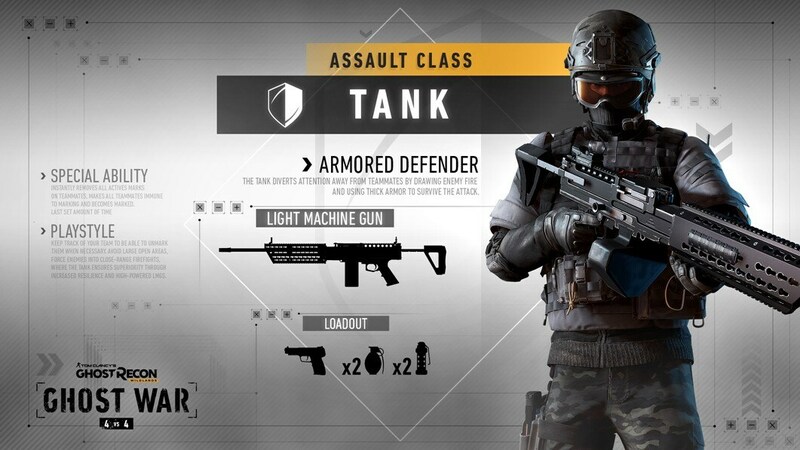 If you are the run-and-gun type, the Tank might just be for you. 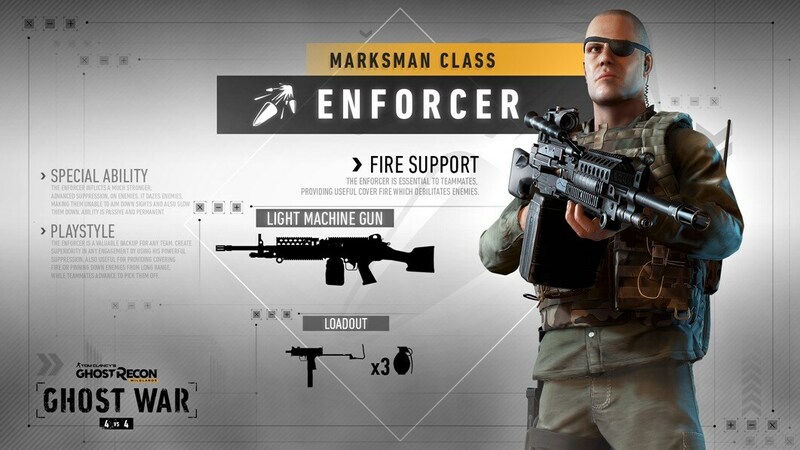 Enforcers fall under the Marksmen category and are a long-range class. They specialize in suppressing enemies from large distances. A valuable backup anytime, Enforcers provide covering fire from afar while their teammates advance to pick off their enemies. Inflicting a strong, advanced suppression, Enforcers daze enemies, making them unable to aim down sights and slowing them down. The ability is passive and permanent. When it is time to advance or when the opponent is being too insistent, Enforcers are there to oppose them with a wall of bullets. Enforcers are great for players who want to suppress their enemies from a distance with a large magazine and avoid the direct frontline. They are perfect for players who love to shoot while denying the enemy the opportunity to shoot back. Artilleries fall under the Support category and bring heavy ordnance backup. They can use their drone to call a mortar strike on a large targeted area. Artilleries’ low firepower is compensated by the mortar drone’s high damage capability. The mortar strike is most useful for area denial, clearing enemies from an entrenched position. It is also deadly for slow-reaction enemies. Artilleries are uniquely trained to take out heavy forces from a distance. Snipers hiding on a mountain range cannot hide when a mortar strike is upon them. There is nowhere to hide when bombs are raining from the sky. Players who enjoy inflicting heavy damage with blood and fire will be the perfect fit for the Artilleries class, whether they choose them for the destruction potential or the tactical use of this mighty tool. We have already introduced you to some of the characters that will be playable in Ghost War; you can find them in Part 1. With Part 2, we have shown you half of the Ghost War classes that will be available at launch, before the updates. Have you started to put together a strategy? Which class is appealing to you so far? Let us know your thoughts on Facebook, Twitter, and our official forums.